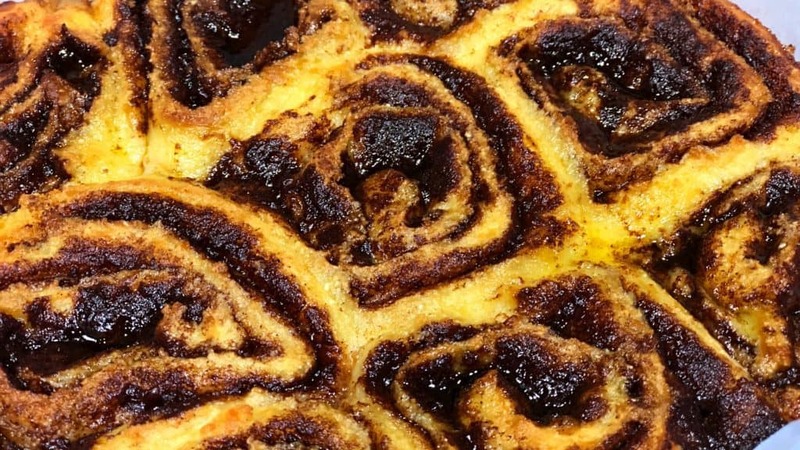 This Keto Cinnamon Roll Recipe is something to make on the weekends for breakfast or as a dessert when you are really feeling like having something special. 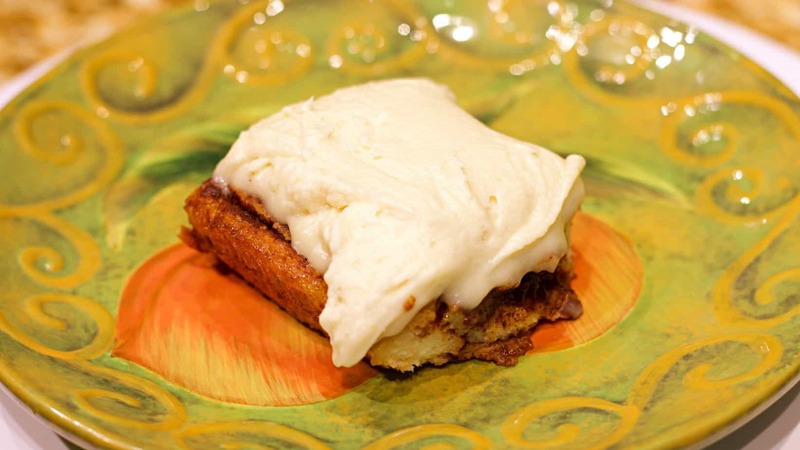 Each frosted cinnamon roll is only 3 to 4 Net Carbs each, which means that you might feel tempted to eat a few of them, but they are more filling than they look. The dough is dense and filling, and there’s plenty of frosting here to go around in this recipe. No more getting charged for extra at the mall. The level of effort that goes into making these is moderate, but totally doable. You have to think of breaking down the process into three steps. First the Dough, then the Filling, then the Frosting. Just read the recipe and go step by step, no need to rush. Also, don’t make the filling before you take the dough out of the fridge, as it will harden up quickly. If it does, just put it in a microwave safe container and heat it up in the microwave to make it fluid again. In a Large Microwave-Safe Mixing Bowl place 2 Cups Shredded Mozzarella Cheese and 3 Ounces of Softened Cream Cheese. Place mixture in Microwave for about 60 seconds. Remove and stir, and return to the microwave for an additional 30-45 seconds. Stir the mixture together well, and then add 1/2 Cup Coconut Flour, 1 TSP Vanilla Extract, Xanthan Gum, 1/4 Cup Monkfruit Sweetener, and 2 Eggs. Stir together well or knead with hands until well mixed. Add remaining Mozzarella Cheese and return to microwave for 30-45 seconds, and remove and stir again. Wrap this dough in plastic wrap and place in the refrigerator for 30-40 minutes to firm up. Remove the dough from the refrigerator, and set on the counter. In a Small Mixing Bowl combing the Golden Monkfruit Sweetener, Cinnamon, and Melted Butter. Place the Dough onto a large sheet of Parchment Paper and fold half of the Parchment Paper on top of the dough so that you can flatten it out by hand or rolling pin without it sticking to everything. After you have rolled the dougn into roughly a large square sheet, brush or spread the cinnamon mixture across the entire surface of the dough. Roll the dough carefully, using the parchment paper to assist you with rolling it evenly. Bake in the oven at 375*F for about 25-30 minutes, or until Golden Brown on top. Cooking times will vary with altitude and humidity, etc. To make the frosting, combine the remaining Cream Cheese, Butter, Lemon Juice, Vanilla Extract and Powdered Monkfruit Sweetener and mix for a few minutes with a hand mixer until well blended. Remove the Cinnamon Roll tray from the oven after cooking and place on the counter to cool for at least 10 minutes before icing the Cinnamon Roll. Serve Warm, and reheat if necessary to soften later. SPECIAL NOTE: These taste really good without the frosting too, so if you want to cut down on prep work, calories, cost or whatever you could choose to just make the cinnamon rolls by the selves, and or jut put some butter on top of them instead. I do not have monk fruit sweetener but I have Suckrin and Sukrin Gold. How would that work? You can, as long as you don’t mind the taste of your preferred sweetener baked. It’s all a personal preference in that regard since we all have different tastebuds. Can I use xylitol sweetner instead of the monk fruit? I find it difficult to find monk fruit and /or swerve in my local grocery stores. what are your thoughts about using xylitol instead of the monkfruit sweeteners? Just curious and don’t know if I can get monkfruit near me. thanks, these look soo good. I typically have to order most of my Monkfruit items online. Not a lot of grocery stores seem to be carrying it yet. I don’t use Xylitol myself, so I don’t know whether it would be a good idea or not. What brand of Monk fruit do you buy? I keep finding Lankanto, but they are not a pure monk fruit. I use Lakanto. Theirs is blended with Erythritol (which is natural, non-glycemic and keto approved). You would not want to measure out PURE monkfruit in these measurements as its hundreds of times more potent than sugar. You need it blended with the erythritol to give is the same body and volume as sugar for the purposes of recipes. xylitol has no after taste, sweetness just as sugar. taken in same amount as sugar in recipes. 1 serving is 1 tsp. Have you used anything other than monkfruit as a sweetener? Could erythritol or swerve be used as a substitute? Debra, the Monkfruit I use is blended with Erythritol, so that should work too if you just have plain Erythritol. I don’t bake with Swerve personally, as the aftertaste is so bitter to me. Especially with how much would be used here in this recipe. Can almond flour be used in place of the coconut flour? Yes you can. I prefer the texture with coconut flour though, as it turns out more like Cinnamon Rolls and less spongey than with almond flour. If you use Almond Flour you will need to roughly triple the amount compared to what I used in Coconut Flour. Would adding a little baking powder help them at all? Maybe make them a little fluffier? Yes, that wouldn’t hurt anything. Xanthan Gum also fluffs them up too. Can the dough be held in the refrigerator for longer than the normal chilling time? For instance, making the dough the night before and making the rolls the next morning? Yes, the dough can be stored in the refrigerator. Some people even make it and then separate it so they can bake things like this fresh one day and then the next. I’m sure on the maximum storage length though, as it does have raw egg in it. I’m allergic to eggs, do you think a flax/psyllium binder would work? Do you know what the calories/nutrition facts would be without the frosting? Your nutritional information is not correct on this recipe. Monk fruit sweetner Lankato has 4g net carbs with no fiber which means this recipies toral carbs are 36 gnet carbs per roll!!!!! I totally was kicked out of Keto by esting one roll! Please do a better job of verifying your nutritional information posted. Kelly, Net Carbs remove Sugar Alcohol from the calculation too. Monkfruit Sweetener has no net carbs and also has no glycemic effect, so it does not effect your blood sugar. I had the same experience of finding that this had way more carbs than claimed per serving. I discovered it when entering this recipe’s ingredients into the MyFitnessPal app. I feel bad because I trusted it and served it to 4 other people who eat the Ketogenic way. Are you making sure to deduct the Sugar Alcohols to get your Net Carbs? MyFitnessPal does NOT calculate NET CARBS. It is the main reason that the Keto community does not use it. Keto Daily did the correct calculations. See their comment below regarding deducting sugar alcohols. Yes, you MUST subtract Sugar Alcohols for Keto. Especially these keto-friendly sweeteners like Erythritol, monkfruit, and stevia. Those do not cause an increase in blood sugar. plus they have no calories. It’s the nasty sugar alcohols like Malitol, Sorbitol, etc that are no good for you (even though you can still subtract those from carbs too). Please use Net Carb calculations. I see a lot of people too that avoid good vegetables because of the Fiber, only because they don’t know how to properly calculate NET carbohydrates. What veggies can you eat besides cauliflower for keto ? Broccoli, Asparagus, Spinach, Zucchini, Kale, Green Beans, Avocado, Celery, Eggplant, Lettuce, Brussel Sprouts, Pumpkin, Tomatoes, Okra, Onion, Cucumber, Radishes, Mushrooms, and a whole lot more. Can the confectioners SWERVE be used in place of ALL the monk fruit in this recipe? I see different kinds of monk fruit, and all I have is Swerve. Thank you! Yes. You definitely want to use a powdered/confectioners in the frosting to keep it smooth. Curious where the sodium content is coming from. Are you using salted butter? Or is it in the flours? Cheese? Husband is on a sodium restrictive diet. Thought it very strange that this was so very high in sodium. But would love to make if I could figure this out. Thanks! I do use Salted Butter in this, and calculate that in the nutrition. I believe that you can, though I have not personally done that. Without the icing, of course. Could the dough be made, wrapped in plastic & placed in the fridge the night before baking?? Yep, no problems with doing that! Hi. First THANK YOU for providing your recipes freely. Secondly, have you considered – at almost no cost to you – Blurb.com where you can upload your recipes with photos and people like me can then order a real physical copy of your recipe book at my cost with you receiving a portion of the sale. Books can be printed only by those who want to buy it? Anyway it’s just a suggestion. I’d love to buy your book. No, I have not. But I am considering producing a printed cookbook at some point in the future, given the positive feedback I keep getting and all of the support from you guys! That is a great idea about the cookbook. Thank you. Keto Daily Admin thank you for these fabulous recipes. They have been a hige help for me as I recently startes keto and a bit overwhelmed. The recipes are clear and concise. Look forward to seeing more. I made these last night! I’m am very impressed with how they came out! I’ve struggled finding good tasting keto desserts. This is definitely getting added to my favorites list. I even used my keto sweetener of choice and still turned out great! Happy to hear that you really liked them too Krystle! How did you get your nutrition values? I figured up a lot more carbs when I entered each ingredient separately. I’m getting 310 cal, 29 net carb, 12 protein, and 24 fat. The only thing I can figure is that you have cinnamon and vanilla extract that are 0 carb. Still confused as to carb calculation. According to this link https://dtc.ucsf.edu/living-with-diabetes/diet-and-nutrition/understanding-carbohydrates/counting-carbohydrates/learning-to-read-labels/counting-sugar-alcohols/ sugar alcohols are included in net carb calculations for diabetics by adding half if over 5g of sugar alcohols. Is it different for non-diabetics how to caliculate net carbs? If so, can you provide a link to a website stating that? monk fruit and erythritol are not part of those sugar alcohols. Not all sugar alcohols are the same so you have to know which ones will have an effect and which ones will not. Continue your research and you will understand better how to calculate which sugar alcohols, and which ones you can disregard entirely. This recipe will not kick you out of ketosis. Not of you use the ingredients she tells you to and avoid substituting with something like Malitol. Where can this sweetener be purchased? Walmart? I have links to it here in the recipe if you click on the name of the ingredient. I also buy it at Sprouts (one of my local natural grocery stores). I don’t believe that Wal Mart sells it yet. You could buy other brands of keto sweeteners at Wal Mart though, but I don’t personally think they all taste the same. Can I use powdered Swerve instead of powered monk fruit? You can, not sure if powdered Swerve is twice as sweet as sugar like the powdered monkfruit is. Just double check the Swerve to see if it is or not. Otherwise you would need to modify the amount of sweetener. Thank you for posting this recipe. I had issues locating the Monk fruit sweetener at local stores. I have ordered the three types used in the recipe. I will be trying this as soon as the sweetener arrives. They look absolutely delicious. Thus far all dessert recipes I have tried did it taste very good. I have a very keen sense of taste. The Sweetener is the BEST tasting in my opinion. And because it is Non-Glycemic too it will not raise your blood sugar and kick you out of Ketosis like Splenda and others can. have gestational diabetes…I can only use Splenda…Would that be okay for this recipe? They would turn out alright with Splenda if that is all you are allowed to use. The flavor should be alright, and use the same measurements too. Thanks again for another great recipe. I made this twice this week and definitely did some tinkering in between. The biggest change was adding a little baking powder to make them a little more fluffy. Also, mixing the icing with the leftover cinnamon and butter has provided a nice topping to other things I’m creating, especially Keto Donuts. Keep up the great work! Do the rolls have a weird texture to them? I wouldn’t say so. Most people think they are just like cinnamon rolls. Do you mind saying how much baking powder you added? I would love to make these for Christmas morning!! how many calories and carbs without the frosting??? im counting both! I’ve been doing Keto for 9 weeks and miss sweets so much. I’ve not made any of these Keto desserts or weird breads because there’s just so many ingredients. But when I saw cream cheese frosting I was sold. I ordered all the sweetener off amazon and it’ll be here Monday! Looking forward to these soooo much! The frosting is really good! You COULD just make it on it’s own real quick to satisfy some cravings for desserts too. Do these have to be refrigerated after baking? I had trouble spreading the dough with my rolling pin It kept breaking apart. Should I have kneaded it after taking it out of the fridge. What could I have done wrong. Did you use a sheet of Parchment Paper on the top and bottom of the dough to prevent it from sticking to the counter and the rolling pin? Can you replace the powdered monk fruit sweetener with powdered erythritol instead? If so, would it be the same measurement? Hi Marilyn. You can use powdered Erythritol too. The monkfruit sweetener I use is mixed with Erythritol, and measures 1:1 for sugar. So as long as the blend you are using is also 1:1 with sugar you can do an equal swap. Hi, this was an awesome recipe. Do I have to refrigerate the cinnamon rolls? Or can I leave them out? Also, the Lakanto Monkfruit Sweetener had an aftertaste for me, reminded me of an overipe mango. Is that normal, or is everyone different? I think that the aftertaste for any type of sweetener is different to everyone, depending on tastebud sensitivities. To me it is the one without aftertaste, and that’s probably just how my tastebuds are. You can leave them out or refrigerate them, but you will want to microwave them before eating them again because they will harden. WOW, these are amazing. I only used half the icing though. Froze the rest for the next batch. They are amazing. Thanks Deborah! Probably a good idea to go lightly on the icing, as it can be very rich when you are not used to sweets anymore. Any idea on the carb count without the frosting? The carb count of the frosting is surprisingly low since Butter, Cream Cheese, and Monkfruit hardly have any. Can I use regular Monkfruit/erythritol instead of golden for the cinnamon spread? What is the difference between the two? You could. The Golden has a slight brown sugar flavor, but it’s not strong anyhow. Can coconut cream be substituted for heavy cream? Can I substitute coconut cream for heavy cream? You should be able to, it could turn out slightly different but I wouldn’t imagine it would be too off.